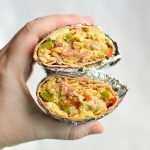 Method and tips for making your own freezer friendly breakfast burritos – perfect for meal prep! Heat olive oil over medium heat in a large/deep skillet. When hot, add onion, pepper, garlic powder, and chili powder. Sauté for 3-4 minutes, stirring occasionally. Add meat and cook thoroughly, until completely cooked, stirring occasionally. Remove from heat. At this point, dump the meat and veggies in a large bowl, drain any excess liquid and set aside to cool. Use a paper towel to wipe out your pan, or use an alternative pan. Reduce heat to low and return the pan to the heat. Add all eggs to the pan and stir continuously until the eggs are completely cooked. Do not over cook – eggs will cook a tiny bit more when your burritos are reheated. Remove the eggs from the pan and set aside to cool. Let everything cool to reduce moisture in the burritos. Set up your burrito assembly line. Warm up your tortillas for 20 seconds in the microwave to make them more foldable and less likely to rip. Make 8 burritos, each with 1 big scoop of mixture and a sprinkle of cheese on top. Wrap your burritos by folding the sides in and wrapping the tortilla to tuck in the sides (like at Chipotle!). Wrap each in foil and store in the freezer. Take a burrito out of the freezer the night before you plan to eat it. Best when reheated in a toaster oven for 7-8 minutes (depending on your toaster oven). You can also toast for 4-5 minutes to get the outside crispy, then microwave for 30-45 more seconds to ensure it’s heated through. Store in the freezer for up to three months. Make sure each burrito is wrapped tightly in plastic wrap or foil. Nutrition information estimated with My Fitness Pal.